Jesse V. Johnson is a producer, writer, director, stunt performer, and stunt coordinator who has been working in the movie business, according to imdb, since the late 1980’s. 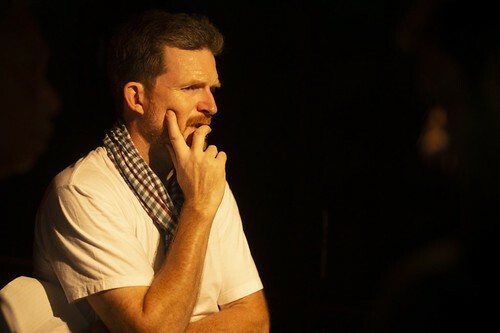 As a stunt performer he has worked on such movies as Total Recall, Cutthroat Island, Starship Troopers, Terminator 3: Rise of the Machines, The Amazing Spider-Man, and Lincoln, and as a director he is responsible for movies like The Fifth Commandment, Savage Dog, Accident Man, and The Debt Collector. Johnson’s latest movie is the badass all-star action epic Triple Threat starring Tony Jaa, Iko Uwais, Tiger Chen, Celina Jade, Michael Jai White, Michael Bisping, and Scott Adkins, which is set to hit 150+ screens for a one night movie theater event on March 19th and then Video On Demand and select movie theaters on March 25th. 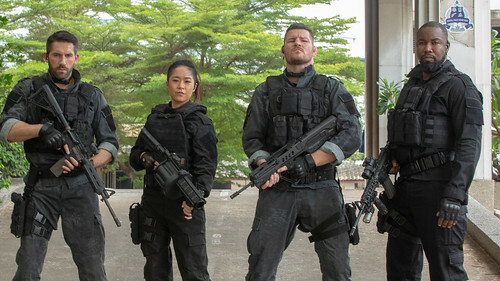 In this interview, Johnson speaks with this writer about making Triple Threat, what it took to put together such a major action star cast, and more. 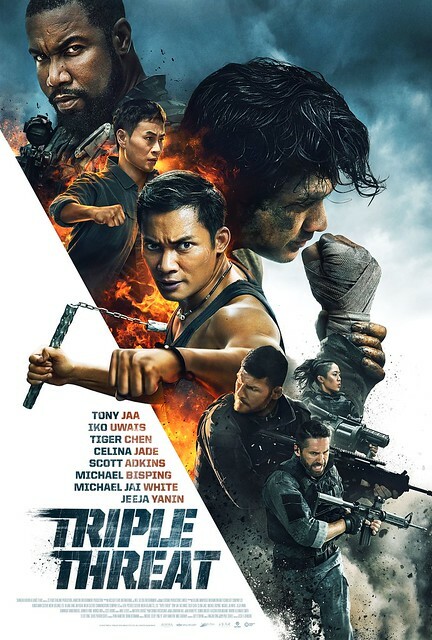 Bryan Kristopowitz: How did you get involved with making Triple Threat? Jesse V. Johnson: I was finishing the principal photography on Accident Man in London, when Mike Gabrawy at Arclight reached out to me. They had a project with three lead actors that needed to be fleshed-out and put into production quickly. There was a ticking-clock associated with the idea-option. So, as soon as we wrapped filming, I flew directly to Bangkok to meet with the team. BK: How did you assemble such an action star heavy cast? How difficult was it to get them all together for one movie? JVJ: The project had been assembled by Tiger Chen. It consisted of Tony Jaa and Iko Uwais and two scripts. We combined those scripts, and came up with one absolutely “rocking” story. I had just worked with Scott Adkins and knew he was a phenomenal movie martial artist who could stand on his own, but that he was also an actor of the stature we needed to face off against this trio of heroes. Michael Jai White and Michael Bisping were cast in Los Angeles (I had just worked with Michael Jai White and was a fan, so that was a no-brainer). When I arrived in Bangkok I contacted everyone I knew there and asked for leads. Ron Smoorenburg was recommended by everyone, and for a reason, he is awesome to work with. I had been a fan of Jeeja Yanin since Chocolate and thankfully Michael Selby, our awesome Thai producer, represented her, so that was an easy hire. Dominiquie Vandenberg was called in as a favor and flew himself out. Celina Jade was also a client of Mike Selby and I was thrilled to have her aboard as she really rounded out a wonderful cast. BK: Where was Triple Threat made? JVJ: Bangkok Thailand with a second unit in Khatanburi Elephant reserve three hours North of Bangkok. BK: How long did it take to actually make Triple Threat, from finishing the script to completing post-production? JVJ: The shoot was five or six weeks give or take holidays. BK: Did the Triple Threat story change at all while making the movie, or is the story that we see in the movie pretty much what it always was in the script? JVJ: The way you work with an international cast and a shifting schedule is that you have to be fluid, and must absolutely have the ability to adapt. An actor, performer or crew may be able to do, perform or film a certain thing better than written, you’re a fool if you don’t allow that to dictate your path. But, that said, the script is your blue-print and you must let it guide you, but, astute judgment should always be observed. BK: Explain your relationship with fight choreographer Tim Man on creating the fights for Triple Threat. What was the hardest fight sequence to put together for the movie? JVJ: I had worked with Tim closely on Accident Man and knew him to be disciplined, determined and dogmatic. He sticks to a plan, and I like that. Where I like to be able to do what I want, I do not encourage that of my creative team – they must do what I ask of them, or the machine breaks down. I sat with Tim, discussed in depth how I wanted the cast to show their fighting styles, how long each fight should be, who would win, and how. How violent they would be. I laid out how they would start, the story-beats and how they would end. Tim would take that information and then weave the most wonderful and creative choreography around my direction, and he is very, very good at this. He has an in-depth knowledge of the different fighting styles, and had worked in Thailand with our stunt team before so it was relatively calm sailing. That said, his work-load was enormous and I don’t think he slept for the first few weeks. If there were acting moments within the fight, I would direct those, but, we worked very, very well together and trusted each other. This was the only way to do it, and when it works as it did on Triple Threat it is incredibly organic and very efficient. BK: Was it hard to find the right balance among the various action bits in the movie: gun battles/shootouts, hand-to-hand fights, and car chases/vehicle stuff? JVJ: Yes, I was continuously second guessing myself, but, I knew that a movie with only physical “martial-arts” would be a failure to all but the die-hard fans. I also understood that having too much “gun-action” with this cast would be a sin, so it was a careful balance. I had everyone sharing their opinion, some complaining to the producers, their agents and anyone who would listen. When they saw the finished film no one complained. BK: The use of subtitles among Tony Jaa, Tiger Chen, and Celina Jade is interesting as their conversations switch, seemingly at random, back and forth between speaking English and subtitles. How did you establish which lines would be in English and which ones would be in subtitles? JVJ: This was designed to mimic real-life as much as possible. I didn’t want the whole film in broken English, but also didn’t want a 100% sub-titled or dubbed movie, and having worked on many international movies, I understood there is an international way of communicating quickly. We tried to replicate that. BK: You’ve been directing action movies for around two decades. How has the action movie business changed since you got started? JVJ: Really the concepts haven’t changed since Buster Keaton made silent one reel movies, but, there are fashions and trends and styles, they come and go. Kurosawa used slow motion intercut with regular speed in an innovative way in The Seven Samurai. Decades later Peckinpah copied it and was called innovative, decades later John Woo used it and was called innovative. Kubrick used fake handheld-doc-style coverage in Dr. Strangelove, Spielberg lifted it for Saving Private Ryan, everyone copied it from him, and now it is as dull to watch as the forced crash zoom once was, which also had a minor resurgence just recently. The moment an executive or new producer starts to discuss new trends and exciting techniques in cinema I laugh to myself (silently, of course) and let them educate me. A rounded knowledge of film is essential to a director, a knowledge that goes back to the silent one reelers, and the work of the great masters, especially if you are going to call yourself an action-director. Right now I see one or two actual trend-setting action directors, the rest are technicians, who with varying degrees of expertise skillfully mimic everyone else. But the simplest and least exciting answer to your question would be that shooting on film was a terrible “pain in the behind” for an action director. It is a lot easier now. BK: What do you hope audiences get out of Triple Threat? JVJ: Entertainment – and that is not a facetious answer. We worked very, very hard to create a story that would wrap you up and transport you away. The stunts are creative, original and real and work in conjunction with the story to thrill you. Hopefully you feel you got your money’s worth and ideally want to watch the film a second time. BK: Since all three guys look jacked as hell in this movie, how did Scott Adkins, Michael Jai White, and Michael Bisping all fit in that van? It doesn’t look big enough for one of them. JVJ: Hah – it was a tight fit and I believe we had some epic moments inside. That street got very narrow and we were traveling pretty quickly. It was all good fun, but we all learned a few international swear words. A very special thanks to Jesse V. Johnson for agreeing to participate in this interview and to Sophie Tran for setting it up. Check out the official Triple Threat website here and Facebook page here. All images courtesy of Well Go USA Entertainment.